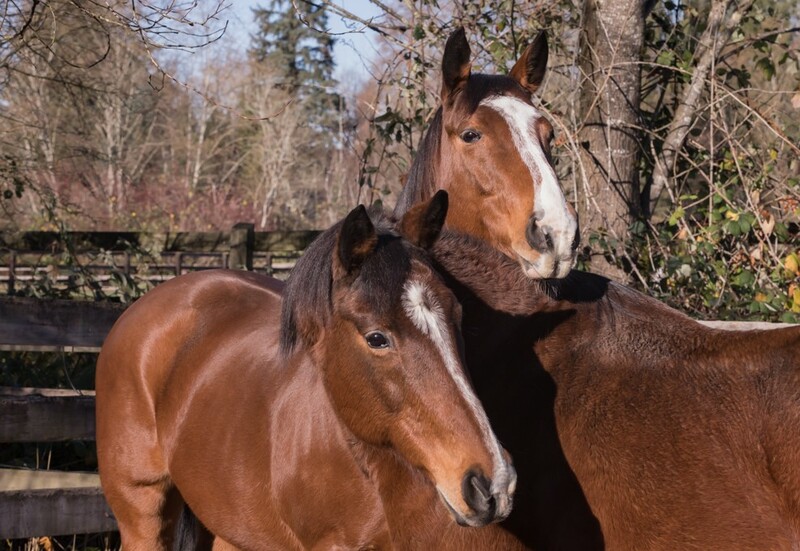 In journalism school, they say “don’t bury the lead,” so I’ll come right out with it: Aurora and Belle are being adopted together to a Thoroughbred sanctuary in northern California. They will live the rest of their lives, together, with nothing expected of them but to be horses. 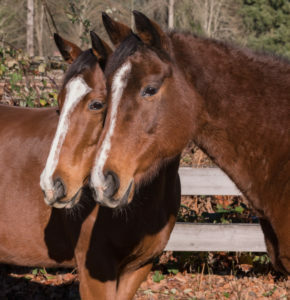 The sanctuary is called Humanity for Horses and already houses about 150 Thoroughbreds on 115 acres near Mt Shasta. We are beside ourselves with joy and relief. Aurora has been a troubling horse since she arrived at SAFE. Being tall, healthy, and sound, we had high hopes of being able to start her under saddle and help her become a fine riding horse for some lucky adopter. The first indication of trouble was the extreme herd‐boundness she and her dam Belle exhibited toward one another. Aurora in particular would completely melt down if she could not see Belle. This is a big horse, and such behavior can be very dangerous. The second indication was during one of her first groundwork sessions with Terry. Working in hand on a 15′ lead rope, she suddenly reared up and struck out at Terry, repeatedly, demonstrating some unusual aggression under reasonably calm circumstances. The next incident took place a few weeks later. Jolene was working with Aurora, and asked her to lift her left front foot, just like you would if you were going to pick her hoof. Aurora suddenly snaked her head around and tried to bite Jolene, who fortunately was able to get out of the way in time. But again, it was an unusual level of aggression during a very calm moment. Both Terry and Jolene are experienced horsewomen who were being careful and alert in her presence. And they’ve both dealt with plenty of “marish” mares over the years. But most angry or upset mares “show their cards” with pinned ears and swishing tails when they think about acting out. Aurora’s attacks came out of nowhere. She’d been handled gently but fairly by experienced staff and volunteers at SAFE, taking her in and out of turnout, and for the most part her behavior had been fine. But in these circumstances, she was always moved in and out of the barn with Belle, and nothing much was being asked of her besides walking respectfully with her handler, something she is quite able to do. Normal handling, she is fine, a typical Thoroughbred. But when she feels pressured…she can strike out. There’s no warning. A few weeks ago, Aurora was hauled over to Ellensburg for a short consultation with Joel Conner. On the second day of this visit, Joel approached Aurora’s left side and she attacked him, knocking him to the ground and tearing the back off his thick winter coat. Joel is a kind and capable horseman with years of experience, good instincts, and superior reflexes. And had he not been wearing a thick coat he would have be severely injured. The attack came out of nowhere, and it was the third strike against Aurora. This lovely mare, whose normal demeanor is kind and gentle, came to us with some severe emotional trauma that likely took place when she was very young. Someone did this to her. Since her attack on Joel, we have been dealing with the harsh reality that we would have to put Aurora down. Not being able to help them all is part of rescue, and there are always going to be hard choices that have to be made. It never stops. Still, the heartbreak we felt for Aurora was so painful. But through the tears and the guilt and the pain, we knew that if someone got hurt…knowing what we knew…it would end us. SAFE would be over. It was not a risk we could take. In order to satisfy ourselves that we’d tried everything, I reached out to every Thoroughbred Aftercare Alliance accredited sanctuary from here to Texas. I explained the situation in detail and said that we were prepared to do the right thing, but I just had to ask…could they take her, knowing she was dangerous, and keep her safe? One after another, the responses came back… each one kind and sympathetic, but apologetic. No one could offer her a place. Every single one told me that euthanization was the only option. Last Tuesday morning, about a half hour after I got the call telling me that Annabelle had passed, my phone rang again. It was Luna from Humanity for Horses, saying that they had discussed our situation at great length, and decided they could take both Aurora and her dam, Belle. They would spend the rest of their lives together, and they would be cared for by people who were very experienced in dealing with TBs with similar issues to what I’d described in Aurora. They’d see the farrier and the vet and whatever other necessary care they’d need, but they would never be ridden, never be adopted, never be separated. Everything we wanted for her, we were offered, by Humanity for Horses. Did I mention that Tuesday was my birthday? It was the greatest present I could ever have imagined. I love Aurora, she’s one of my favorites, and I felt that putting her down was going to devastate me. Now she gets to live, and my heart is filled with joy and relief. We’ll update when the girls are transported to their new home. Wow. That’s a great result from hard work and compassion. Congratulations. You are an angel! A wonderful end to this story! Bless you!! Again, angels in our midst. Thank you for doing what is right for the safety of your staff/volunteers and also going the extra mile to do what you could for these 2 mares. God Bless.